Dr. Luc L. Colas, MD, Esq. Dr. Luc L. Colas devoted his life to leading, teaching and giving. His spirit lives on in the many who have been formed and elevated by his presence and accomplishments. Guided by the legacy of Dr. Luc Colas are doctors, lawyers, judges, mayors, diplomats, etc …our leaders of today and tomorrow, most visibly in Haiti. Education was a centerpiece throughout his life. Dr. Luc Colas is known to have been an exceptionally accomplished man of character, intellect, discipline and vision; with an extraordinary love for, and faith in, humankind. Born in 1921 in Cap-Haitian Haiti, one of eight children, young Luc Colas excelled in school to become a respected medical doctor, lawyer, judge, college president, college dean and college professor. Dr. Colas also became a founding member of the Rotary Club in Cap-Haitian and later represented Haiti on a medical mission to Hong Kong as a Rotarian. With an impressive list of accomplishments as a medical doctor in various regions of the world, and having held key posts for the United Nations W.H.O. 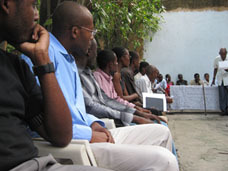 in Haiti and in Africa; Dr. Colas made a decision to take another leap forward. At the age of 64 yrs. Dr. Luc Colas returned to school to study law. 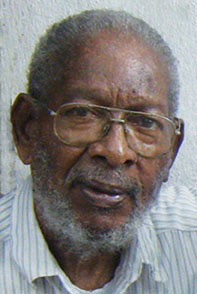 He graduated top of his class, practiced law and later accepted the posts of Government Commissioner and Judge in Haiti. For Dr. Luc L. Colas life was a classroom and he soaked up volumes while he was there. As Dr. Colas was being educated, he was educating. The young people around him were inspired and followed in his footsteps. Integrity and discipline were hallmarks. This thought leader and educator gained a reputation for pulling people together and leading intellectual dialogue on a variety of topics. He stimulated this type of dialogue in his classes, at informal gatherings, at dinner, in presentations, with his family, and at his home when hosting students. A favorite discussion topic of Dr. Luc Colas was that of the life of one of the brightest minds in Haiti’s history, Sénateur Emile Saint-Lot. These dialogue sessions are legendary and are now a part of the Le Flambeau Foundation programming. Throughout his life Dr. Luc L. Colas overcame obstacles, knocking down barriers as he walked through doors previously bolted for those of his origin and hue. Life for him was not always easy as he often chose the paths less traveled, forging new avenues of opportunity for those less fortunate. His talent for assisting the underserved, particularly the young, was a driving force that made his life most complete. In 2004 Dr. Colas spearheaded the birth of the Le Flambeau Foundation in Haiti; resulting in scholars from Haiti attending college in the U.S. These scholars excelled, including one who recently graduated from Harvard University with a master’s degree in education. The shorter term transitional scholarships, an innovative format originally proposed by Dr. Luc Colas, is now an integral component of the Le Flambeau Foundation scholarships programming. Dr. Colas traveled the world helping others in Zaire/Congo, the U.S., Turks and Caicos, Canada, Venezuela, Germany and China; completing his journey at home in Haiti at the age of 88. His gift for educating lives on. Dr. Luc Colas is the embodiment of the Le Flambeau Foundation mission – providing youth of Haiti with educational opportunities that prepare them to lead the country’s transition from poverty to prosperity, with dignity. The legacy built by Dr. Luc L. Colas is one that will guide us forward for years to come.